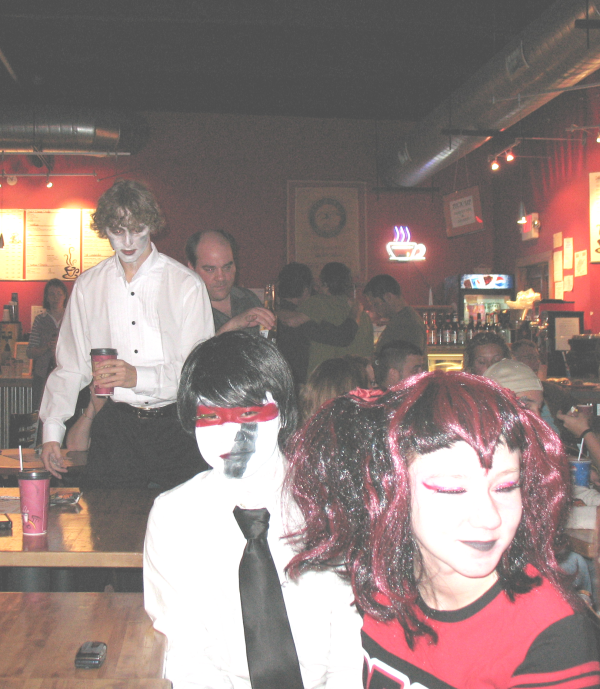 The Radio Free Charleston crew invaded Capitol Roasters over the weekend and turned a Whistlepunk show into a Halloween party. The joint was packed, and luckily, we had several people show up in costume, so I wasn’t sitting their in my pirate outfit looking like a total dork. 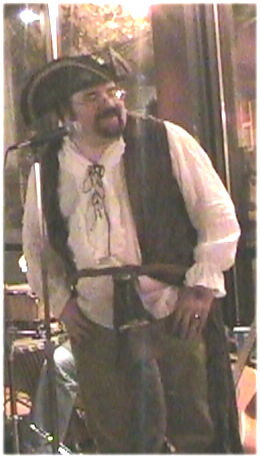 It was a night of big fun and great music, as Whistlepunk delighted the packed house and we saw some great costumes. We’re going to show you highlights from the party next week on Radio Free Charleston, but for now here’s a preview photo essay. Just follow the jump. 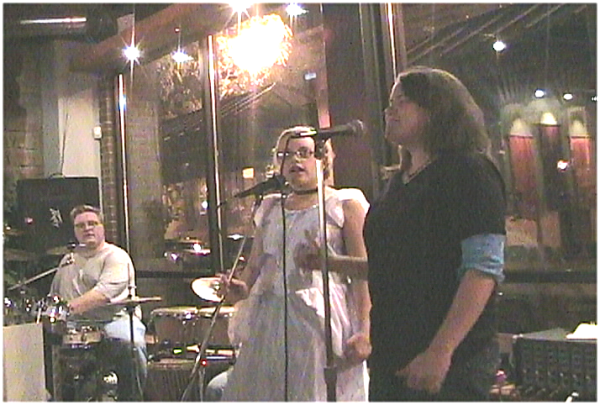 Princess, Cadence Young, last seen beating me senseless in episode 26 of RFC, joined the band for their cover of The Pixies’ “Here Comes Your Man.” Proud papa Brian looks on from behind the drum kit, as Cadence backs up Karen Allen on vocals. Laura and Jonathon-AKA “Captain Crash And The Beauty Queen From Mars” AKA “Aurora” from episode 22 of Radio Free Charleston– Showed up decked out as a dead cheerleader and her prom date. “Save the cheerleader?” Sorry, too late. 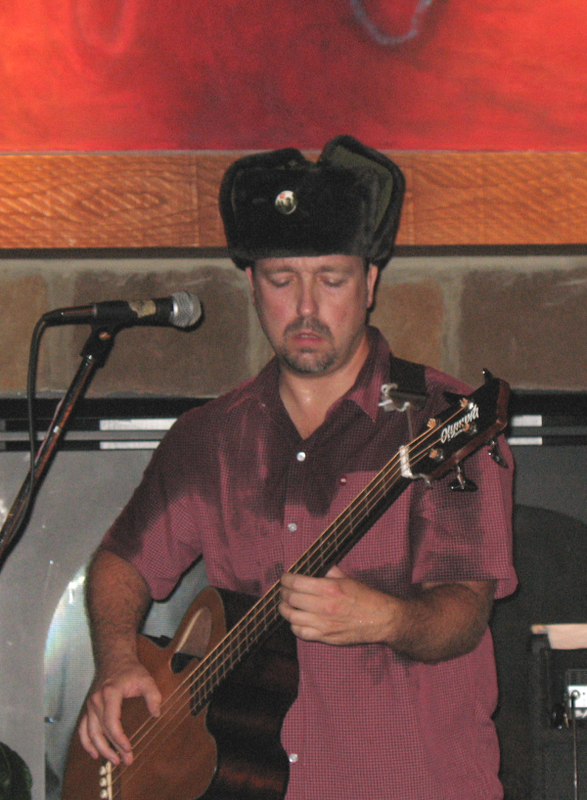 Whistlepunk’s bassist extraordinaire, Dan Jordan, sported a Cossack’s hat for several songs, much to the delight of the large number of Ukrainians in the audience. Dan would like it to be known that he was not actually wearing a Nun’s habit in the photo that ran in the Gazz last week. He does not own a Nun’s habit, and does not condone the impersonation of a Bride of Christ by members of the opposite gender. Check out Whistlepunk in RFC episodes 1, 7, 20, and 26. 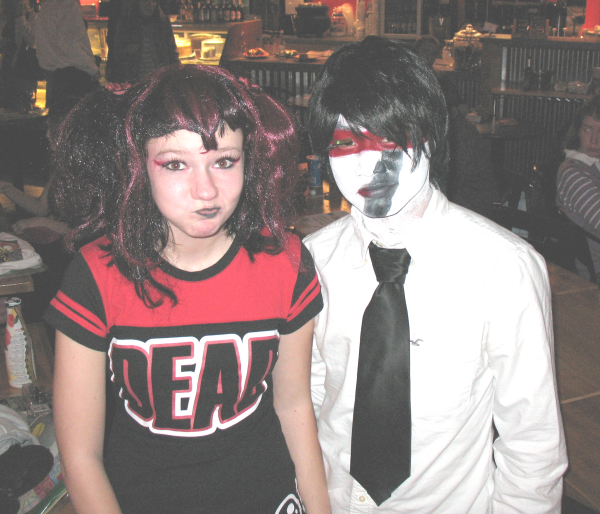 Justin James, the guitarist for Seven Minutes Till Midnight (seen in RFC episode 24 and also in our latest show, the Beatles Tribute episode) is the vampire sneaking up behind Laura and Jonathon. He’s carrying a double mocha latte….WITH BLOOD! 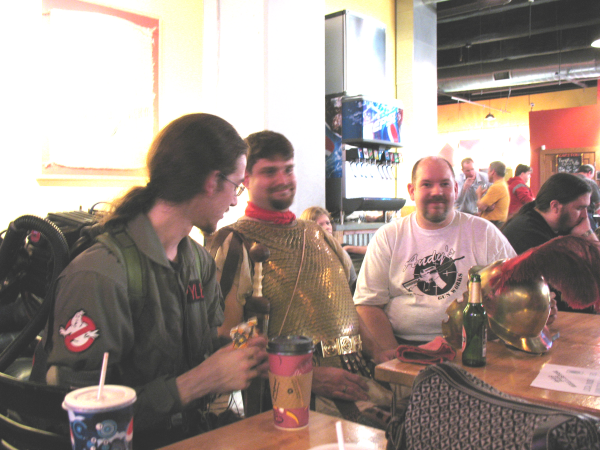 A Ghostbuster, a Gladiator and an NRA member walk into a coffee shop…. ..actually, Dan the Ghostbuster and Paul the Gladiator left before prizes were given out, so if you guys contact me, I’ll get you each a set of CODA comics, a New Music Feast CD, and an RFC button. 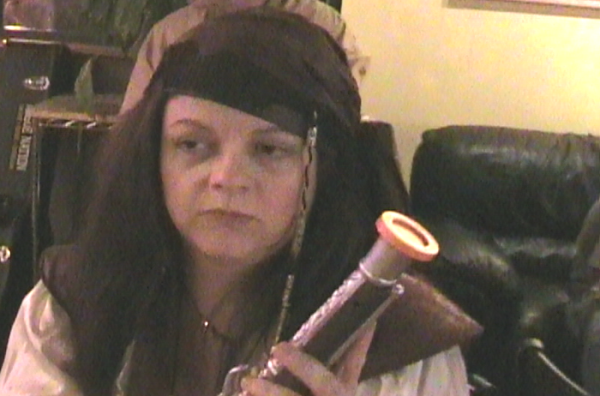 RFC Big Shot Melanie Larch, who thankfully stepped up to emcee the prize distribution, seen here deep in thought as she tries to decide if “Pirate Wench” is an insult, or a term of endearment. 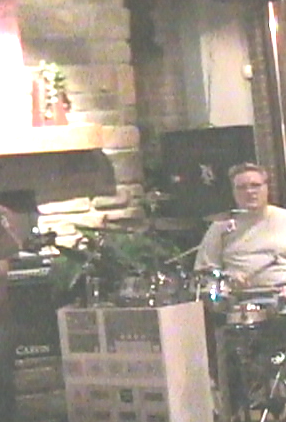 At left we have Whistlepunk drummer, and RFC Big Shot, Brian Young, whose drum kit came dressed as a drum machine. Ironic, because Brian actually IS a drum machine. It’s some sort of Bionic thing. It cost a fortune, and it took forever for the parts to get here when he ordered them from Musician’s Friend, because their warehouse was in a state of disarray, but really, he’s part machine. You can tell when you see him drum. No human could play that fast. 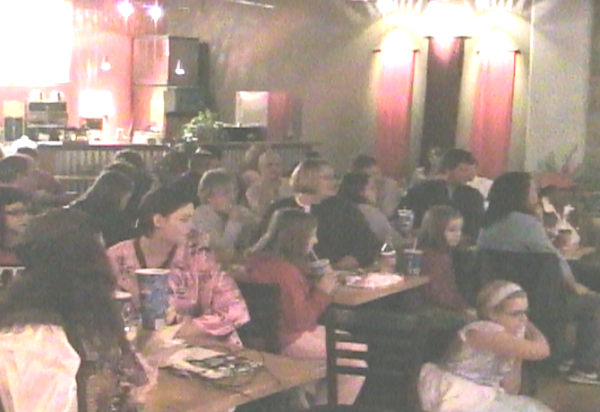 The crowd was enthralled by Whistlepunk’s performance. The music was so captivating that after a while you didn’t even notice the vampires, pirates, geisha, princesses, zombies, gladiators, ghostbusters, and various animals in the audience. We leave you with a quick glimpse of Sean Richardson and official RFC barista, Chelsea Cook. You’ll see just exactly what they’re up to here in next week’s show. Be sure to check PopCult to see when the show is posted. We’ll talk more about the party in the production notes. I might add that the Cossack hat was probably about as warm as a Nun’s outfit.. The hat will be relagated back to shoveling snow.. and for when i want to embarass my kids..
the Ukrainians did love the hat..They snapped a pic of me in it with thier crew ..who’d a thunk that? How dare you borrow one of my blouses without asking my permission? Yeah, like we wear the same size. Geez. It looks as if it was a fun gathering. 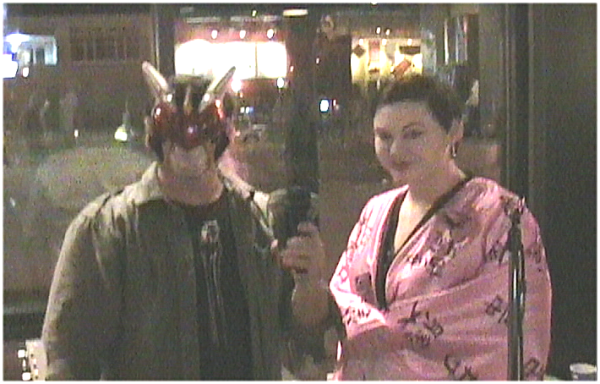 I would have made an appearance, had that not involved leaving my apartment. Was everyone in attendance wearing socks? Huh? No reason. Hey, creatures of the night don’t need no stinkin’ socks…or good smellin’ ones for that matter! 😉 Looks like a fun time was had by all! Sorry to say that I am a first time reader. But I was at the Whistlepunk show Sat. night. I loved it. Did you check you check out Dare to Direct on Chiller TV….page 22 “First Date” by Robert Haddy’s class at Capitol? It’s not too late if you forgot. Russell Crowe Ain’t Got Nuttin’ on Me! Damn! Looks like I picked the wrong week to be in the hospital. Looks like a fun time. Hot wimmin in costumes and music by Whistlepunk? Dammit I wish I was back in Charleston!! Duh. There are never enough vampires.